The Newage Pin Brinell is the de-facto standard for economical Brinell hardness measurement. This simple-to-use and inexpensive tester can be used across the entire Brinell range (HB100 to HB700). 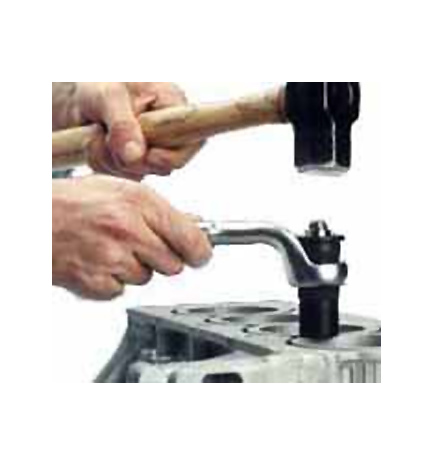 The Pin Brinell applies force to the indenter by the operator using a hammer or a clamping device. The force applied is controlled using a calibrated shear pin. When the load is applied and the force applied reaches the shear pin’s shear limit, the shear pin breaks. The diameter of the resulting indentation can then be read on a Brinell scope, such as our HiLight scope, or for more exacting measurements, on the Newage B.O.S.S. system. The Pin Brinell’s load to indentation size ratio provides a displacement that is equivalent to the most common Brinell test (3000 kg load, 10mm ball). The Brinell values are arrived at using the standard Brinell formula. Available in two models: the CPIT Impact Tester and CPST Static & Impact Tester. The Pin Brinell is compact and is ideal for those applications where mounting the sample on a more traditional bench tester may be impractical.